“Mark brings more heart to his work than any leader I know. “Heart” for him is not soft, although he can be very tender and gentle when the situation calls for it. He is able to say the hard things to hold people accountable, and grow them beyond what they even envisioned for themselves. In this episode, we talk about Mark’s three-pronged leadership style, making your people feel valued and the importance of feeling heard and feeling safe. Mark Nagel currently is a Sr Leader in the People Department (Human Resources) at Southwest Airlines leading a special focus on HR Transformation and HR Technologies. Prior to Southwest Airlines Mark was a HR Director Best Buy for 15 years, covering a variety of HR operational areas including Affirmative Action, HR compliance and Employee Relations. In his spare time Mark serves on the Board of Directors and sings in Resounding Harmony, a non-profit chorus that performs concerts for other non-profits, raising funds and awareness for their causes. He also serves as Vice President of the North Texas Industry Liaison Group- an organization that helps federal contractors share best practices in Affirmative Action. The companies Mark worked for in the past really believed in unleashing the power of their people, or every individual. As a leader, my job is to make sure that everybody can feel that, because some people might not feel comfortable doing that. There might be something hindering them. It’s either something that’s in their environment; it might be something that happened to them in the past. So how can we make sure that that is unleashed? Make sure that every day, when they come in, they feel like, “I can totally be myself and I’ve got something to add. I’ve got something to add to the story; I’ve got something to add to the work that we’re doing. That’s what drives me, helping people discover that. What does leading with “heart” mean to you? For Mark, it starts with being a servant to your team. One of my favorite phrases is, everybody should feel comfortable to lead from any seat at the table. 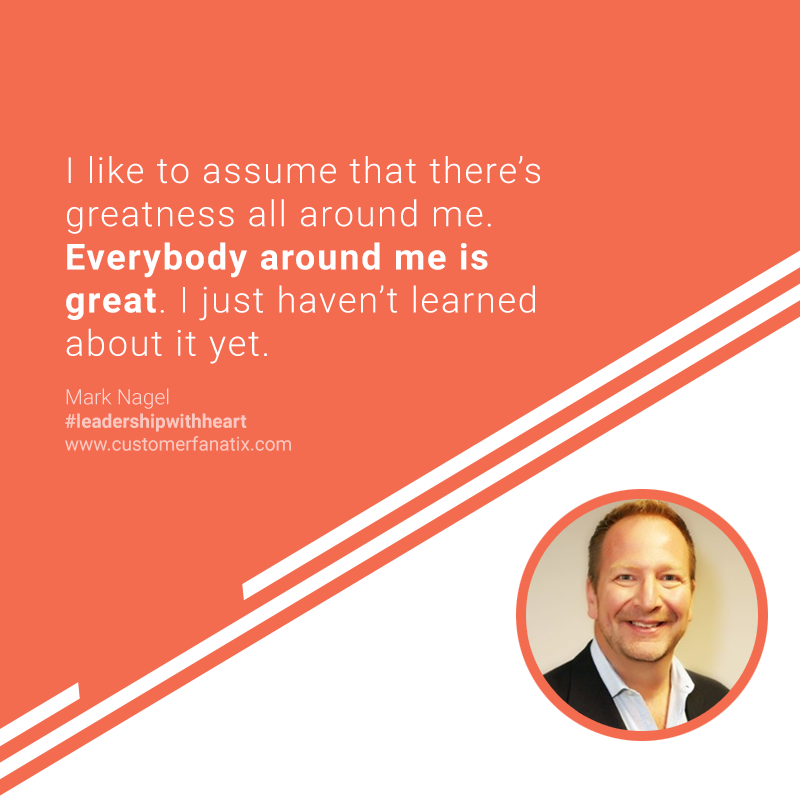 It’s not about me as a leader…we all, at different times of the journey, are going to be sitting at that leadership seat and we all need to feel comfortable with looking to each other for those leadership moments. Never think that you know it all, and make it a point to learn from your team every day. That’s the thing that at times, leaders feel like they have to put a big ‘S’ on their chest and “I’ve got to know everything and I’ve got to have all the answers for them”. But again, if we go back to that 80/20 rule, 80% of those answers are found within our team. We need to always have our learner’s hat onand say, “What can I learn from each of my team members today?” and to thank them for that. Subscribe, rate and review the podcast on iTunes!